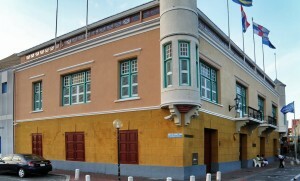 WILLEMSTAD - The Maduro & Curiel’s Bank (MCB) Group made a ​​record profit of nearly 194 million guilders last year. After paying tax money there were still some 147 million guilders left. An eventual increase of 2 % compared to 2012. The loan portfolio expanded to more than 4 billion guilders in loans for individuals and businesses. The total assets increased by almost 7 % to 694.2 million guilders. The high capitalization of the MCB Group, which is largely in the hands of The Bank of Nova Scotia in Canada, will remain, in its own words, a strong point of which the owners want to radiate strength and confidence. MCB publishes today its financial year results 2013 through advertisements in the newspapers, and is the first bank that meets the requirement of the Central Bank regulator. The MCB Group is the largest banking group in Curacao and the former Netherlands Antilles.